Welcome to the website of Verbeek Bedrijfstaichi. We are an agency based in Utrecht, The Netherlands, that organises tai chi and mindfulness meditation workshops and classes for companies. 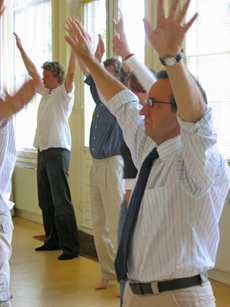 The word ‘bedrijfstaichi’ means ‘corporate tai chi’ or ‘business tai chi’. Originally tai chi is a Chinese martial art – like kung fu. Nowadays most practitioners engage in tai chi for the stress reducing and health benefits. Tai chi is practised daily by millions of people in China, and is rapidly gaining populairity in the West. For more detailed information about tai chi we recommend Wikipedia. We organise corporate tai chi workshops for both small and large groups – up to 500 participants. Usually in Holland and Belgium, but as our network of professional tai chi teachers extends into several European countries, we may be able to help you out there as well. Apart from workshops, we also teach weekly classes during lunchbreak to promote good health for office workers and combat absenteeism. Basically we would like to be your business partner when tai chi is involved. Since 2010 we also offer mindfulness courses and workshops. We have been working for Capgemini, Deutsche Bank, Maersk, Philips, Rabobank, Sara Lee and Unilever, to name but a few. As the rest of this website is in the Dutch language only, we can imagine you might have some further questions. Please feel free to contact Tjeerd Verbeek. Alternatively, you can use Googles automatic translation service to browse this Dutch website in ‘English’.